The boxwood pomegranate Christmas wreath has all the staple colors of Christmas, making it the attractive and impressive option for anyone with a preference for wreaths with a little extra something. With a boxwood base, colorful pomegranates, natural and red eucalyptus, and white marshmallow sticks, the contrasting, bold colors of the wreath are sure to draw the eye of others and bring a smile to faces around the holidays. Built by hand and always crafted with care, you know that your fresh wreath from Christmas Farms will be the best that you can get. If you’re tired of getting wreaths that all look like the next, break from traditional colors this year with the Bentley door wreath from Premium Wreaths by Christmas Farms. Different from the usual red and green wreaths you’re used to, the Bentley is given a blue accent with blueberry juniper and leafy blues. 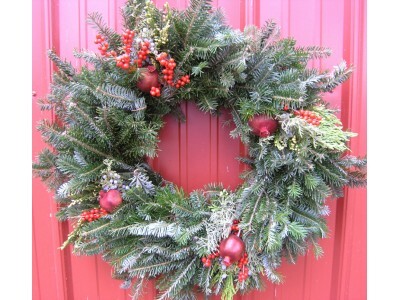 This combined with traditional boxwood creates a unique and beautiful wreath that is guaranteed to satisfy. On top of the visual appeal, the juniper of the Bentley wreath will give you one of the familiar Christmas smells. Although not your typical wreath, it is sure to bring a smile at the holidays. Christmas Farms is the family owned business in southwest Michigan that you can count on for all your fresh Christmas trees and wreaths. With a wide variety of greens to choose from, you can get your favorite for the holidays year after year.